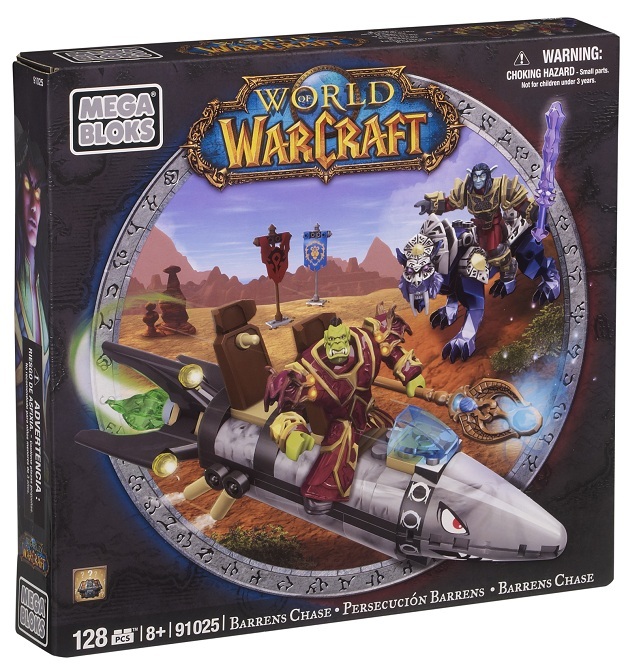 Product Detail Summary: 91025 is 128 pieces and is a buildable “two-fer” mount set featuring the exclusive X-53 touring rocket and Darnassian Nightsaber, as they battle to control the Horde and Alliance Flags. Dragath, the great Orc Warlock, commands the exclusive X-53 2-seater Rocket and battles with Tanaver, the brave Night Elf Warrior on his Darnassian Nightsaber! Both heroes feature interchangeable gear, including the collectable Malefic Raiment spaulders! Also includes a random loot drop- armor or weapons- to add to your collection! Buildable Horde X-53 Touring Rocket mount, with seats for two micro action figures. Buildable Alliance Darnassian Nightsaber mount, with seat for micro action figure. Buildable Orc Warlock and Night Elf Warrior micro action figures with customizable gear. Includes a random loot drop.